The flight to Paro offers one of the most spectacular views of all mountain flight. One can see Mt. Everest, Kanchenjunga, Makalu, and the peaks in Bhutan such as Jhomolhari, Jichu Drakey, and Tsherim Gang. The first gift from Bhutan will be cool, clean fresh air as you step out of the airplane. 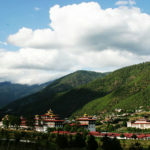 You will be received by our representative and transfer you to the Hotel in Paro. After lunch visit Ta Dzong former Watch Tower which now houses the National Museum and then visits Rinpung Dzong which houses the monastic school and the office of the civil administration and walks down passing close by crossing the Bhutanese typical wooden roofed bridge to Paro town, overnight at hotel. After early breakfast drive up to the Ramthangka (base camp) of Taktsang and then hike up to the most famous monastery Taktsang, the Tiger’s nest. This magical monastery clings to the vertical granite cliff of 3,000 above the valley floor. It is believed that Guru meditated here in the 8th century. The disciples of Guru built the temple, which was later enlarged by Zhabdrung in the 17th century. After lunch walks back down. Further, drive towards the north to visit ruins of Drukgyel Dzong built in 1646 by Zhabdrung Ngawang Namgyel. From there one can see Mt. Jumolhari (mountain of goddesses) overnight at hotel. 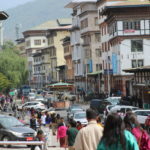 After breakfast, drive to Punakha-approximately 4-hours drive through picturesque valleys and mountains slopes dotted with typical Bhutanese villages. From the Dochula pass, at over 10,000ft, vast panoramic views of the high snowcapped peaks of the Bhutanese Himalaya can be enjoyed on a clear day. Continue to drive down into Punakha valley. 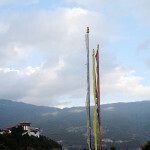 On the way visit, Chhimi Lhakhang-this was founded in 15 century by lam Drukpa Kinley was also known as divine mad man. It is a half hour walk across a local village and rice field. After lunch visits Punakha Dzong – built in 1637 by Zhabdrung. It is one of the most beautiful dzongs in the country. Later walk around Punakha and khuruthang town. Overnight at the hotel. After breakfast, drive to Phobjikha- is a bowl-shaped valley on the western slopes of Black Mountain. 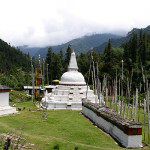 After lunch visit, Gantey Goenpa – is a major attraction with an old monastery date back to the 16 century. Later walk around the valley which is also the winter home to the rare black-necked cranes, which migrate, from remote parts of Tibet, China and Siberia during winter to this valley. Overnight will be at the hotel. After breakfast, drives to Bumthang via Pelela pass at the altitude of 3,150 meters, a wonderful opportunity for photographs. En-route stops at Chummy village to visit Yathra weaving central. Which Yathra are made into colorful scarves, bags, blankets, and sweater. Continue drive to Bumthang. Mingle with the locals and overnight at the hotel. Whole day sightseeing. Chakhar Lhakhang (Iron Castle). It is the site of the palace of the Indian King Sendha Gyab also known as Sindhu Raja. Kurjey Lhakhang (Kurjey means, “Body imprint”). The temple to the right was built by Minjur Tempa in 1652. 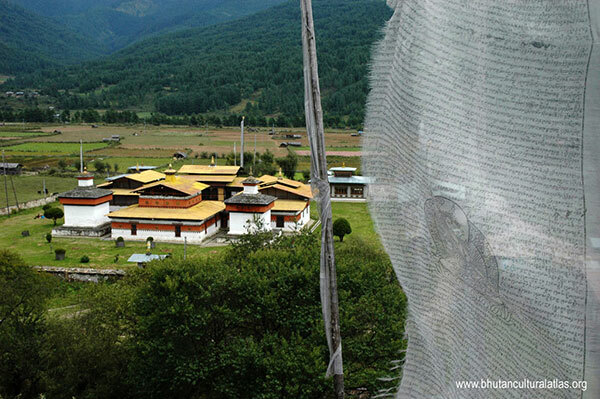 It was built around the cave in which Guru Rinpoche meditated and left his body imprint. Tamshing Lhakhang. This temple is also known as Tamshing Lhendrup Chholing (Temple of the Good Message). And visit Jakar Dzong. The fortress is now used as an administrative center of the valley and summer residence of monks. Later in the evening witness the festival. The first day of the festival begins in the late night. Black Hat Dance (Shana) and of the Gings (emanations of Guru Rimpoche. Costume: Dancers, wearing long brocade robes and ornate black hats, perform this dance. The dancers’ who represent the Ging wear shorter robes with masks. This dance is performed to purify the ground and to chase away evil influences. Dance of Offering (Tshogcham): A dancer offers the body of evil spirits to the deities. After the offering is made the audience goes outside the temple where an arch of pine bushes has been erected. Fire Dance (Mecham): The arch of pine is set on fire. The fire is said to purify the earth of evil spirits. People who pass through the arch have their sins cleansed. A dancer chases away the evil spirits. After breakfast, attend the second day of Jambay Lhakhang Drup (festival). You will watch the number of different dances, subdivided into three categories: those that are intended to give moral instruction; those that are designed to drive away evil spirits and those that celebrate the Buddhist faith in its many guises. This is the occasion where the local people, dressed in their finest clothes, come to attend the festival with packed lunches. After lunch drive to Tang valley to visit MebarTsho (Burning Lake), the night will halt in the hotel. Dance of SingjeYab Yum (Lord of death and his consort): The Lord of Death and his consort perform this dance to protect the four realms over which he has power. Dance of Nyulema and Peling Ging Sum (Three kinds of Ging): The Nyulema is an evil spirit represented by a boy in a skeleton mask. The Ging with the sticks catches the Nyulema. The Durdag or the Lords of the Cremation Ground (represented with dancers wearing white skeletal masks) bring forward a box, which represents evil spirits. The Ging with swords liberates the mind of the evil spirit by killing its body of flesh. The Ging with drums dances to celebrate the victory of religion over the evil spirit. Dance of the Jachung Bochung (Two mythical birds): Dancers wearing masks representing the auspicious birds perform the dance. The play of the Atsara Gapo Pawo Solgyo (Atsara who acts like a Pawo) though most of the stories and plays were original with Buddhist subtext they now serve as comedy relief for the crowd. This story is about an Atsara (clown with a red mask) who is mad. The Atsara injures his son, as he did not recognize him. He tries to save his son’s life by impersonating a Pawo or medium and tries to perform a religious curative ceremony. Being unsuccessful he has to finally call a doctor and a monk to cure his son. After breakfast drive to Trongsa. And then Visit Trongsa Dzong – the seat of the district administration, built in 1648. And visit Tower of Trongsa -converted into the museum from a watchtower that once guarded Trongsa Dzong against internal rebellion, stands in Bhutan’s history. Overnight at the hotel. After breakfast drive to Thimphu. Overnight at the hotel. Buddha Point/ Kuensel Phodang – Is the largest Buddha statue in the country, from there you can get a good view of the Thimphu valley. – Changangkha Lhakhang – it is right above Thimphu Valley, this temple and a monastic school were established in the 12th century on a site chosen by Lama Phajo Drugom Shigpo. – Motithang Takin Preserve – houses the rare national animal of Bhutan. Takin is listed by international conservation agencies as a vulnerable species and it is a rare animal found only in Bhutan, Nepal, and Burma. – Traditional Medicine Institute – In Bhutan, equal emphasis is given to both allopathic and traditional medicines. The rich herbal medicines made up from medicinal plants are prepared and dispensed here. – National Institute for Zorig Chusum – or the school of Arts and crafts is an institute where student undertake a six-year course on the 13 traditional arts and crafts of Bhutan. – Folk Heritage Museum – the house replicates a traditional farmhouse and is furnished as it would have been about a century ago.